On the Mississippi River between river mile 171.9 and 191.2 AOR (Above Ohio River), covering 19.3 miles of riverbank along 6,000 acres of commercial/industrial development at the heart of the Inland Waterway. intersection of three US Dept. of Transportation Marine Highways, M70, M35, and M55. completed Mississippi River Bridge carries I-70 traffic. Served by six of the seven Class One railroads and several short lines. Close to two international airports, Lambert-St. Louis in MO and, in IL, Mid-America Airport; close to Scott AFB, home of TRANSCOM, in IL. Close to major transcontinental pipelines. Between Lock 27 and the JB Bridge there is fleeting capacity of 1,400 – 1,750 barges depending on river stages. There is also fleeting capacity between Lock 26 and Lock 27 for 300 barges. Located about 1.5 mles north of downtown, the City of St. Louis Municipal River Terminal is a 40-acre general purpose, public facility with a recently rebuilt 2000′ dock. 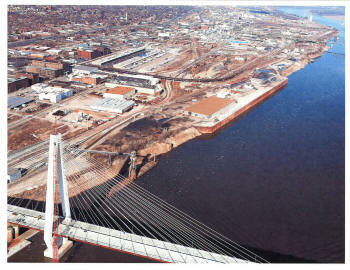 In 2015 the City negotiated a 25-year operator lease for the Municipal River Terminal with SCF Lewis and Clark Terminals. Contact Paul Wellhausen at SCF, 618-973-1012, for information about transloading bulk commodities, open and closed storage options, and fleeting services at the Municipal River Terminal. Large, multimodal network at the heart of America’s commercial traffic; per US Army Corps, the PMSL covers 70 miles along both sides of the Mississippi from river mile 138.8 to 208.8 (AOR). Handles more than 36 million tons of freight each year; major shipper of grain, coal, petroleum products, scrap metals, aggregates, and chemicals. Northern-most lock- and ice-free port on the Mississippi River. Second largest inland port by trip-ton miles, third largest by tonnage. Over 130 piers, wharves, docks, fleeting, and other facilities with 16 public terminals. The PMSL’s 11 river crossings ensure maximum, multimodal connectivity for all the region’s businesses. Twenty-nine industrial centers with a population of 90 million can be reached from St. Louis by barge. Serves as a storage, commodity transfer, and distribution point for goods destined for worldwide transport. 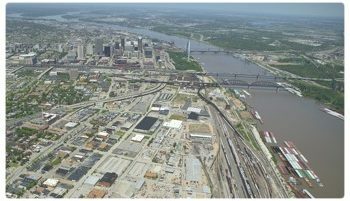 Industrial development sites available in the City’s 3000-acre North Riverfront Commerce Corridor.